Society of Barley Engineers will be holding our fifth annual SBE Holiday Party. It will take place the evening of Wednesday, December 12 at Chris Banker’s home in southeast Oceanside. Directions will be sent to those who RSVP. This will be a casual holiday gathering with potluck food and beer sharing. It will be a chance for everyone to get together outside of regular meetings, share homebrew and food, and celebrate a great year of beer. Open to members and their guests. Festive casual attire is encouraged. Please bring a food item to share, along with any homebrew or commercial beers you wish to share. Kegs can be accommodated with advance notice (sign up in the RSVP). We will have special guest speaker Peter Zien, CEO of Alesmith, who will lead a discussion entitled The Maturing of the Craft Beer Industry – A New Era Begins. Society of Barley Engineers and Veterans Association of North County (VANC) are working together to run the First Annual VANC Oktoberfest. 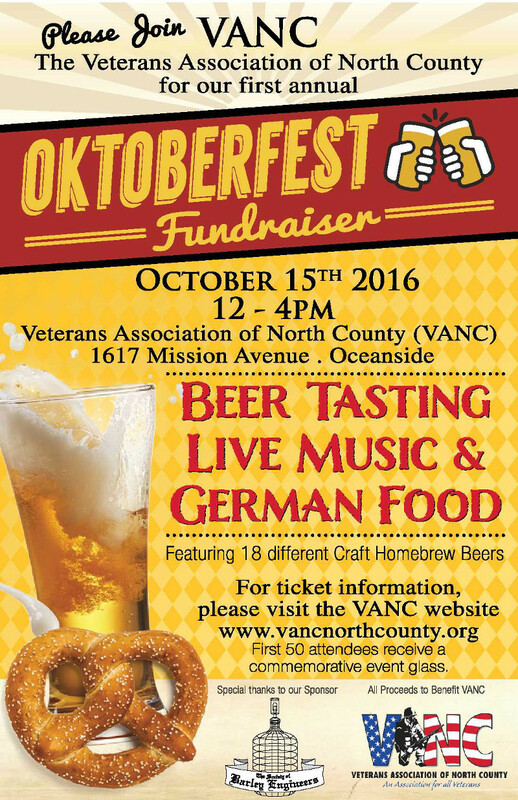 The event will be held on Oktober 15th at VANC’s facility in Oceanside. All proceeds will benefit the Veterans Association of North County. See the flyer below for details. Tickets are available at the VANC website. SBE’s 20th Anniversary was recently featured in the San Diego Union-Tribune.